Local residents and visitors to Tunkhannock (top) relaxed and listen to music in Riverside Park on July 21. Above, children who had participated during the previous week in a music camp at the Dietrich Theater assembled on the stage to perform a pair of folk songs with Tim and Abi Zieger. While the threat of rain may have kept a few people away from Tunkhannock’s River Day on Saturday, those who thumbed their noses at the forecast found plenty of things to do and see at Riverside Park. 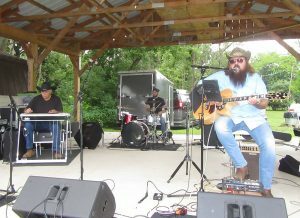 Many in fact said that the cloudy, breezy weather was much more enjoyable than the extreme heat that has plagued the event in previous years. 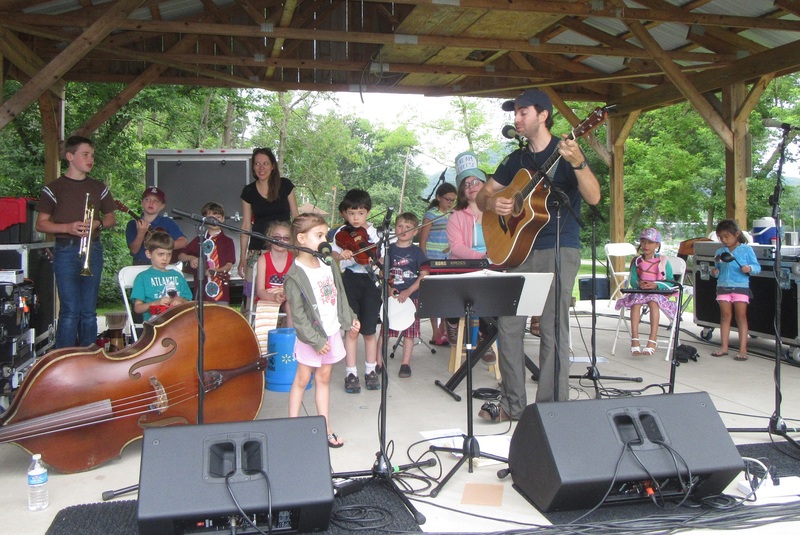 Live music permeated the grounds, while numerous organizations provided recreation, group discussions and hands-on activities related to the nature of the Susquehanna River Valley. 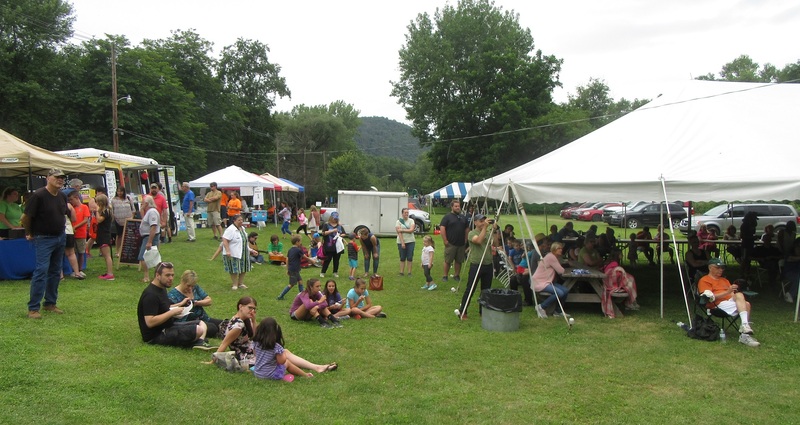 Endless Mountains Outfitters and Susquehanna Kayak & Canoe Rentals put dozens of people on the river for paddles and floats of various lengths. 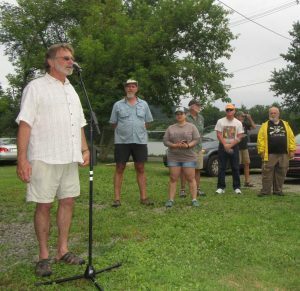 Some of the participants are already members of the 444 Club, and elite group who have paddled all 444 miles of the North Branch and main stem of the river. Between performances by Retro Rocket (above) and Flatland Ruckus (below), Endless Mountains Heritage Region water trail managers Emily Rinaldi and Dana Rockwell introduced newer and long-time 444 Club members and spoke of the importance of getting out on the water. 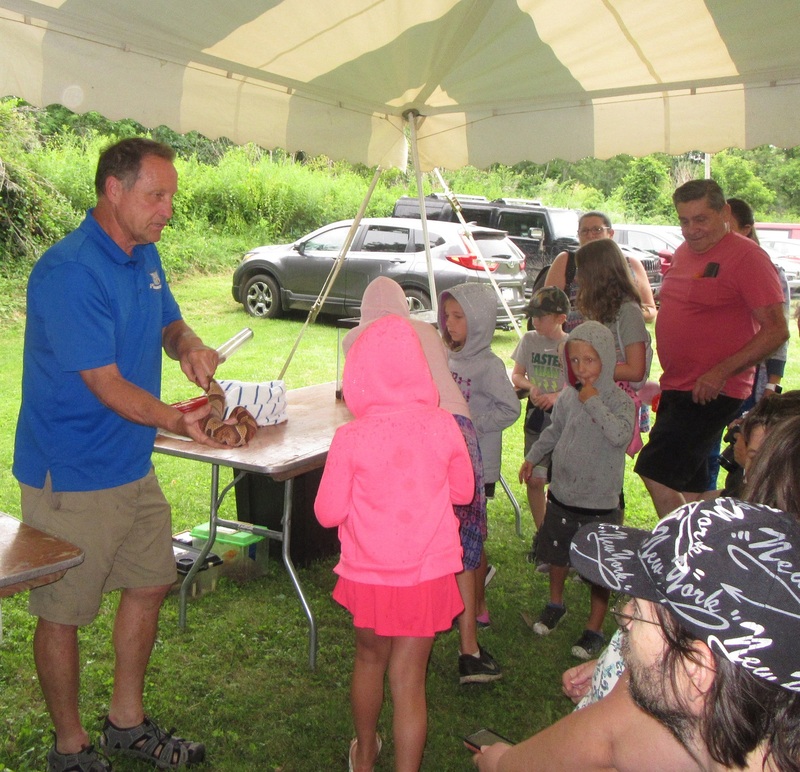 “A lot of people are familiar with their stretch of the river,” said 444 Club member and retired EMHR water trail manager David Buck (below, left), who effectively “passed the torch” to Rockwell and Rinaldi in the course of their presentation. “We’d like to see people get out and experience the rest of the river,” Buck added. 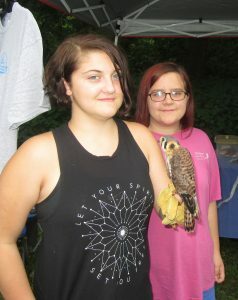 Endless Mountains Nature Center director Rebecca Lesko (above) and volunteer Amanda Phillips (below, left) brought a number of rescued raptors to the park, including a red tailed hawk, a barred owl, and an American kestrel hawk named Kes. The owl, which seemed to want to take flight during the presentation, had been hit by a water truck and is now blind in one eye. 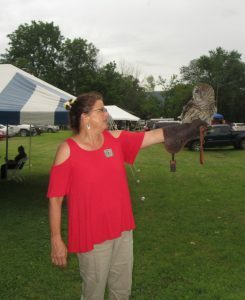 Nonetheless, due to its neck containing nearly twice the vertabrae as humans and being able to turn its head completely around, the owl was able to keep an eye on everything and everyone. 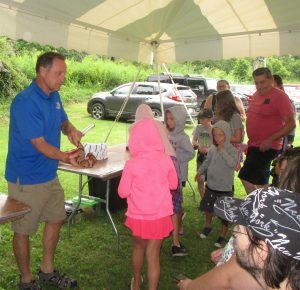 Rick Koval (below, left) delighted youngsters with snakes and other reptiles. In order to allow children to safely feel the texture of Justin Timbersnake’s body, he held the rattle snake with its head in a tube. 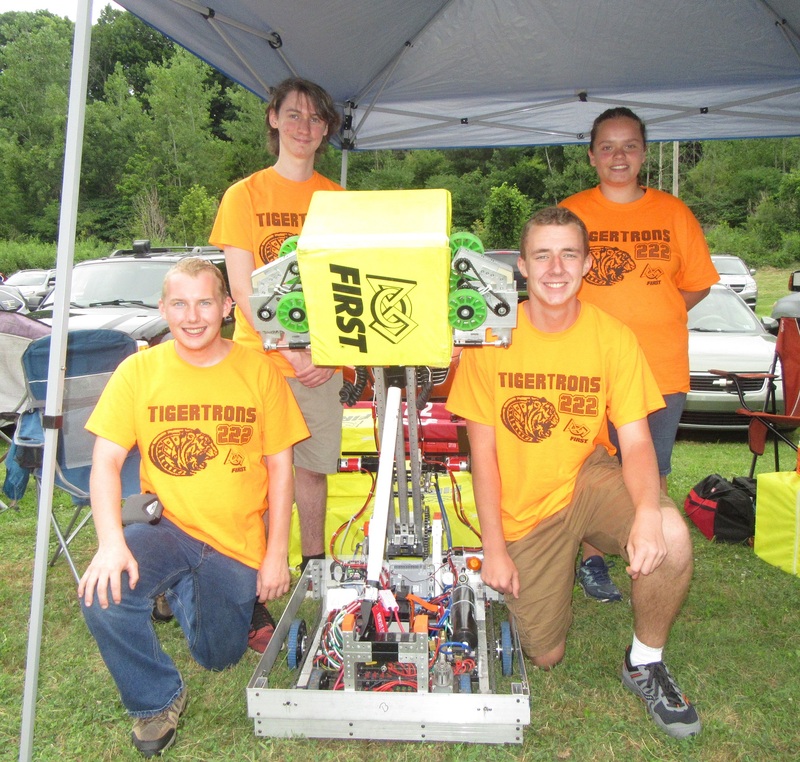 Lesko also had a bright orange corn snake with her that attracted a lot of attention. Though traditionally found in southeastern states, corn snakes have also been found as close to this region as New Jersey. 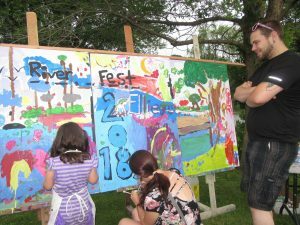 Whole families kept busy painting rocks and adding to an evolving mural (below) under the direction of representatives from the Kitson Arts Alliance. 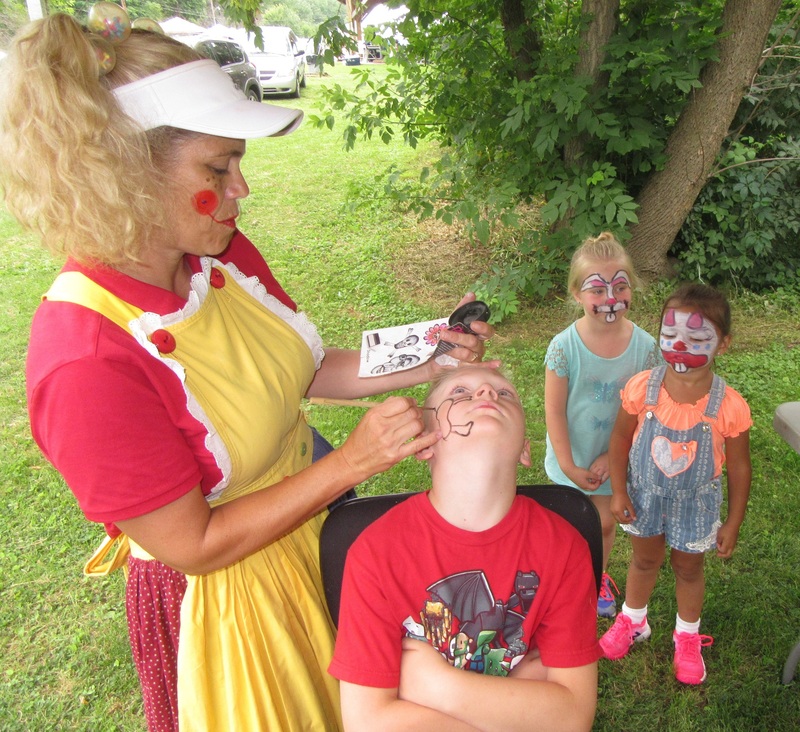 Silly Sally put kids on the other end of the brush as she rendered a wide variety of face paintings throughout the day. 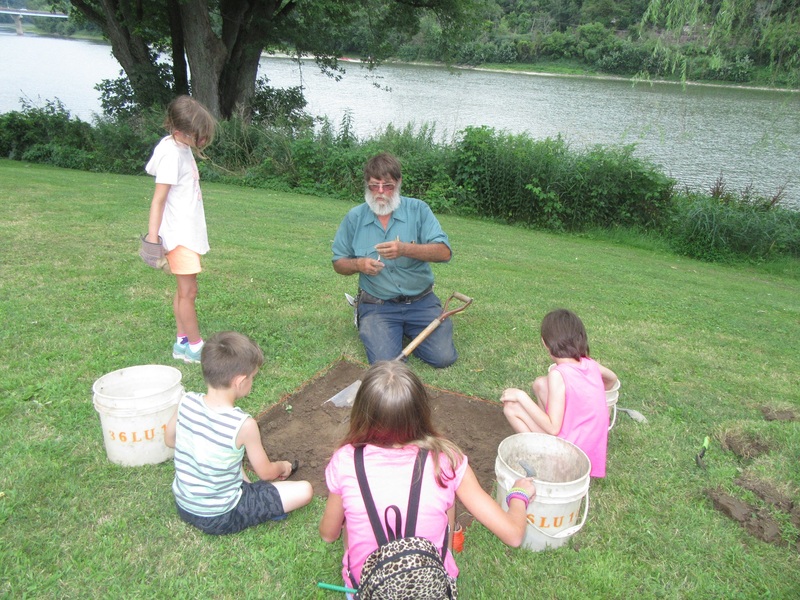 Representatives of the Frances Dorrance Chapter of the PA Archaeological Society set up a mock dig along the river bank, allowing youths to dig up and sift a bucket of soil to “encounter” artifacts and learn about sediment layers. The Pennsylvania Game Commission made many young friends with two stuffed eagles and information about their return to the region. 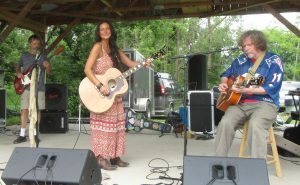 Throughout the event, people could be seen on the water and traveling to and from the boat landing. 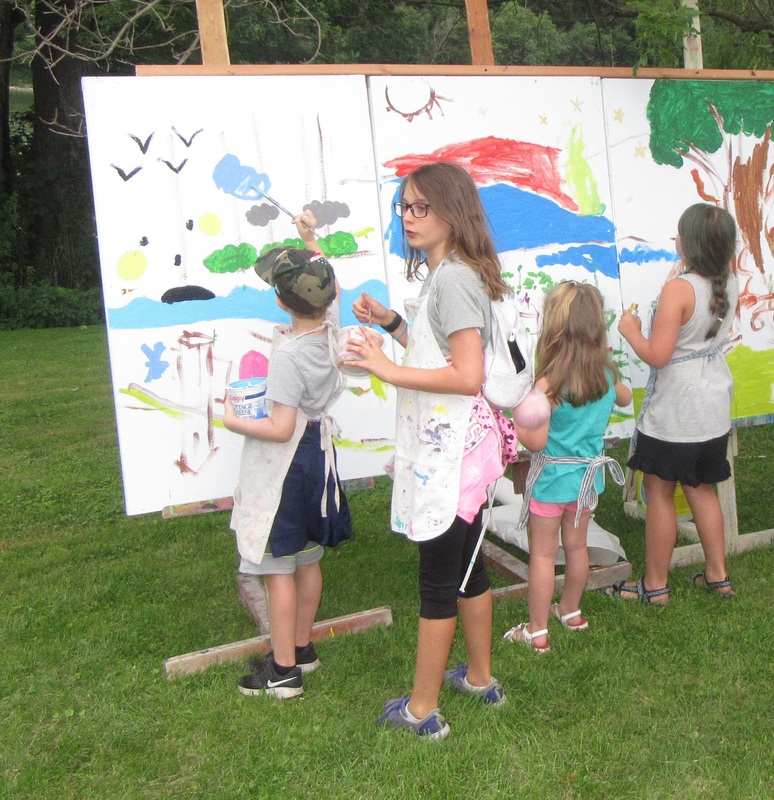 In 2016, the EMHR and Susquehanna Greenway Partnership recognized Tunkhannock as an official RiverTown for both its enhanced public access and River Day, a celebration coordinated by the Wyoming County Cultural Center that will mark its 15th year in 2019. Mike Goldsmith of the Frances Dorrence Chapter of the PA Archaeological Society dusts off a piece of pottery found by Olivia Keller (standing). Helping her with the dig are cousins and siblings (seated, from left) Carter King, Kaitlynn Keller and Riley King. 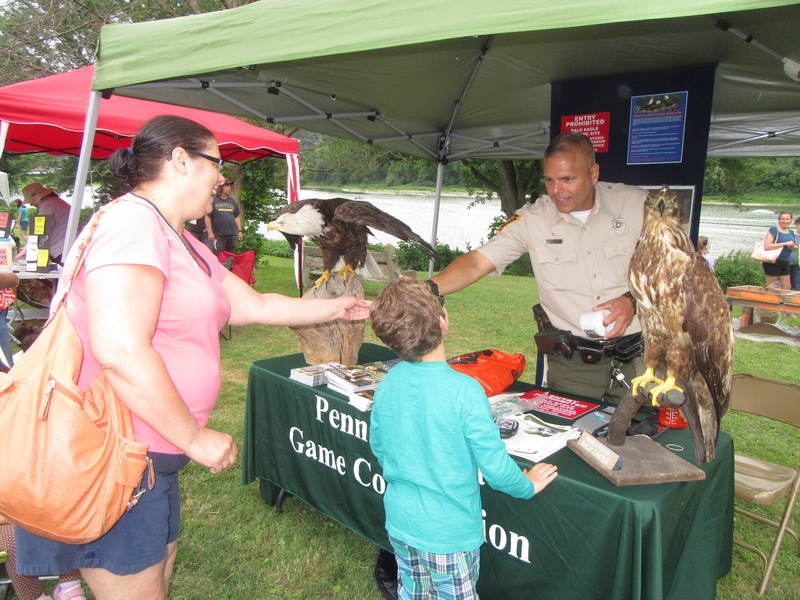 Pennsylvania Game Commission officer Victor Rosa gives Rose Hernandez a sticker for her son, Robert, as he feeds the boy’s fascination about eagles. 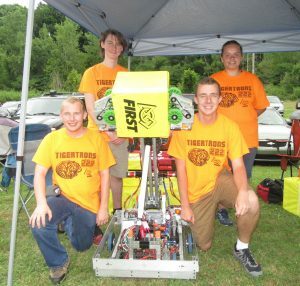 Members of the TigerTrons robotic team, including (kneeling, from left) Max Lawson and Isaiah Forba and (standing) Kyle Stackhouse and Mariah Tague, demonstrated their newest machine and sold snow cones at River Day. 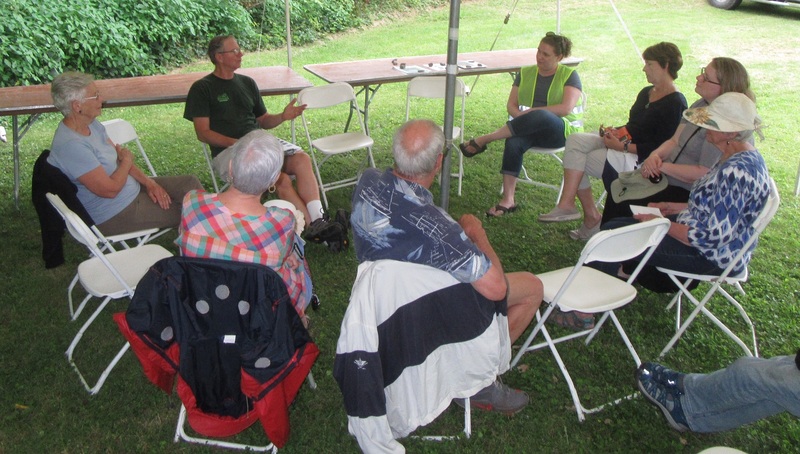 Ed Zygmunt led a discussion about the Penn State Cooperative Extension’s Watershed Management Program. 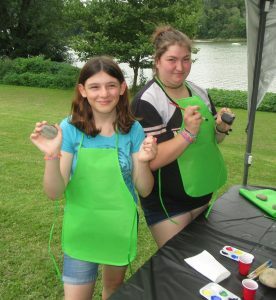 Putting their artistic touch on river rocks on Saturday were Miracle Cahoon and Breanna Gresh. Already sporting their own face paintings, Grace Rosario (far right) and Emily Godfrey look on as Silly Sally starts a design for Levi Godfrey (seated). Making their marks on an evolving mural on River Day are (from left) Jake and Grace Potrzuski and Maddie and Savannah King.